In the late 1600s the land that is now Juan Pablo Duarte Square was developed as a farm by Trinity Church. A forty-foot-wide canal was built to the south in 1810 to drain the pestilent Collect Pond into the Hudson River. The canal was filled in 1819 and now forms Canal Street. As the city spread northward, this became an important commercial thoroughfare. Canal Street achieved further prominence with the construction of the Holland Tunnel at its western end in 1927. Juan Pablo Duarte Square was officially dedicated in 1945, when Sixth Avenue was renamed Avenue of the Americas in celebration of Pan-American unity. The name of the square, located near the southern end of the Avenue of the Americas, honors Juan Pablo Duarte (1813-1876), the liberator of the Dominican Republic. As a young man, Duarte founded a society called La Trinitaria which sought to promote democratic ideals among the Spanish-speaking inhabitants of Hispaniola Island, most of whom were clustered around the city of Santo Domingo. In 1843 Duarte launched an attempt to free the eastern half of the island from Haitian rule. When the rebellion failed, Duarte fled Hispaniola. However, when a new revolution succeeded in winning independence for the Dominican Republic in February 1844, Duarte was invited to return as President of the new republic. 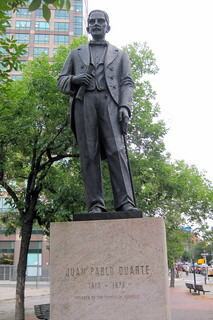 Although he eventually lost control to a military dictator and died in exile, Duarte was instrumental in developing the Pan-American traditions of democracy and self-government celebrated by the Avenue of the Americas. Duarte Square, a triangular plot bounded by Sullivan Street, Grand Street, and the Avenue of the Americas at the intersection with Canal Street, was initially developed and maintained by the Department of Transportation. The square was improved in 1975 with the addition of benches, trees, and sidewalks. On May 26, 1977, Duarte Square was transferred to the Department of Parks. A statue of Juan Pablo Duarte, donated by the Consulate of the Dominican Republic, was dedicated in the square on the 165th anniversary of Duarte’s birth, January 26, 1978. The thirteen-foot bronze figure, which rests atop an eight-foot granite base, was designed by the Italian sculptor Nicola Arrighini. It is one of a pantheon of six monuments to Latin American leaders which overlook the Avenue of the Americas.